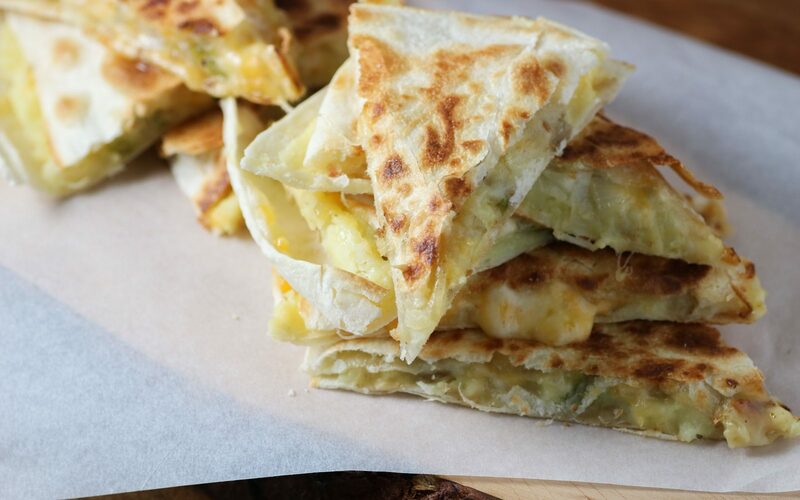 A delicious quesadilla with pierogi flavours the whole family will love! Boil the potatoes in salted water for about 17 to 18 minutes until very tender. Mash with the butter and skim milk. Set aside to cool slightly. Cook onions and jalapeños in canola oil in a medium sauté pan on medium heat until onions are translucent. Season with salt and pepper. Set aside. Divide the mashed potato among four large tortillas shells and smooth out to half-inch of the edge. Top each with one-quarter of the onion and jalapeño mixture. Place about 3/4 cup of the cheese over top of each tortilla. Cover with the second tortilla on each. Spray the top of the tortilla with cooking spray and also a large-sized sauté pan. Place the quesadilla in the sauté pan with the sprayed tortilla side up. Cook on medium high heat until golden brown, flip and cook the other side until golden also. Slice with a pizza cutter into wedges and serve with sour cream.